Rapper Eminem will release his first new album since 2004 on Tuesday, May 19th. There was speculation that his 3 years off might mean permanent retirement from recording, but recently Eminem said he plans to release two albums this year, the first being Relapse which comes out Tuesday. The way Relapse is being marketed and distributed reflects some of the more innovative approaches to making money/adding value to music in the post-MP3 era. While the old model has been disrupted, new ideas that are starting to catch on have a lot of positive aspects, especially for fans who want (and are willing to pay) for more from their favorite artists. To his point, many mainstream artists are embracing novel approaches to releasing new music, these include “Deluxe Editions” with DVDs and other extras such as Bruce Springsteen and U2 have recently done. Bon Jovi has bundled iTunes downloads with concert tickets. Even Metallica, one of the most notoriously anti-MP3 performers in the industry, have embraced digital downloads and similar combo-offers that give fans exclusive and early access to their music. Most bands haven’t gone as far as Nine Inch Nails who have released music under a creative commons license and directly uploaded high quality versions to bit torrent sites. Radiohead famously released an album with a limited-time, choose-your-own-price to pay download offer which seems to have been successful. All of these non-traditional moves from big rock stars, the bold and mild alike, show that the industry is finally coming to terms with a file-sharing world. For Eminem’s album there are a host of special packages fans can pre-order the album in various digital formats with special exclusive extras available on Eminem.com. These include a limited run t-shirt, a print autographed by the rapper, and a special Relapse prescription pill bottle that you clasp in your sweaty hand, just like Marshall Mathers (used to?). There’s also a special interactive website (set at the “Popsomp Hills” asylum). In terms of the music itself, if you pay for the basic package you can download in your choice of DRM-free 320kbps MP3, FLAC and Apple Lossless formats (starting the day of the album’s release). For more money, they will send you a CD or vinyl copy of the album, in addition to the digital. With all packages you get to download a video from the album immediately, even before the album release, and anyone can grab and embed the streaming widget above for free, which has samples from the songs and 2 full length videos plus some other extras. If some of that seems similar to the type of promotion & packages that were offered a few months back for the release of the remastered 20th anniversary edition of The Beastie Boys’ album Paul’s Boutique, it’s not a coincidence. Both album releases were overseen by Topspin Media. Topspin does the widgets, like the one above, and other backend technology, and I assume plans and puts together the special packages. Brian Eno has put his music where his column is: his collaboration with David Byrne, the album Everything That Happens Will Happen Today, was released in the fall of 2008 with a similar set of packages also through Topspin. Eno and Byrne released the album without any major record label being involved. Ian Rogers, CEO of Topspin, has a deeper connection with the Beasties. 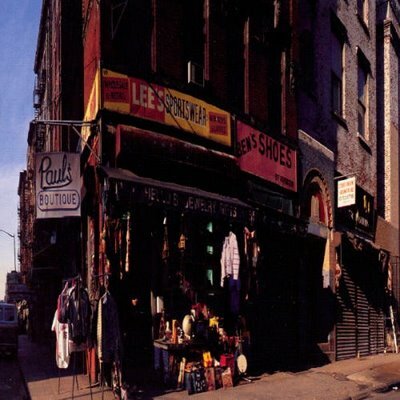 He became an obsessed fan of the group starting with the release of Paul’s Boutique, went on to compile their discography and put it up on Usenet and ultimately the Web. Eventually his fan site came to the band’s attention, and the rest is history which he relates in detail on his blog. Rogers previously worked for a company called NullSoft which made a little program called WinAmp that kinda had something to do with that toothpaste situation as well. He went on to work for the Beasties’ Grand Royal record label and to head up Yahoo! Music. * Along the way he also produced a daughter named Zoe who gained some notoriety as a precocious online teenage DJ. Full disclosure: my day job is at Yahoo!, where I met Ian Rogers exactly once. I don’t know him personally or have any association with Topspin. I do think what they are doing is cool (as you can tell). Mostly though I am a former college radio nerd and an insatiable music consumer (in every sense of the word), so I’m excited to see the industry finally embracing the inevitable digital revolution.